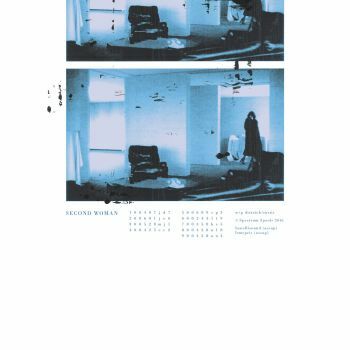 Second Woman is a new collaborative project featuring Turk Dietrich of Belong and Joshua Eustis of the renowned Telefon Tel Aviv. As one would imagine, Second Woman is a nonpareil debut of futuristic electronic music fusing the coveted genetics of the duos respective previous endeavors into an alluring new enigma of ASMR-inducing kaleidoscopic dub. Second Woman is a fully realized entity; a well-crafted sound world and a refreshing shared effort which is inspiring in its purity and painstaking in its design. The opening "100407jd7" wastes no time exhibiting mastery in both sound and structure, contorting the frequency spectrum into a psychoactive mirage with its mutating tectonics and vaporous tone clouds. Cuts like "200601je6" and "700358bc5" are bar-raising examples of veteran craftsmanship and vision, refining and reengineering the blue prints of their early works to create an original and dynamic album. The deliberation and control over every particle is obsessive, but the end results of each individual track unfold with an organic temperament unparalleled in a grid-locked world of DAW shaped musics and rat's-nest modular aleatory. Words fail where essential sonics are concerned, and this vital new creation speaks for itself.